What was lost from the 1820 Census? While the problem of losing census records was improved by 1820, the 1820 census records for Arkansas Territory, Missouri Territory and New Jersey were lost. Some 1820 census records were lost for counties in Alabama and eastern counties of Tennessee. Some 1820 census records were lost of counties in Maine but were found in the late 20th century. 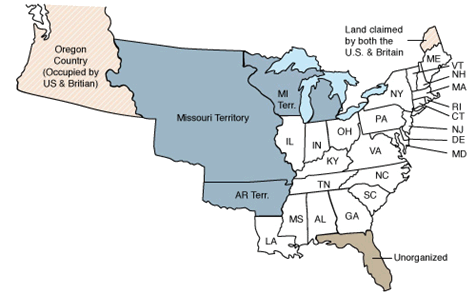 Of the 7,239,881 people living in the United States in 1810, 1,130,781 were slaves. It took $209,000, approximately 1,188 enumerators and 288 published reports to complete the 1820 census. The US population increased by 33.1 percent from the 1810 census to the 1820 census. March 30, 1822: Florida is purchased from Spain and becomes an official territory of the United States.